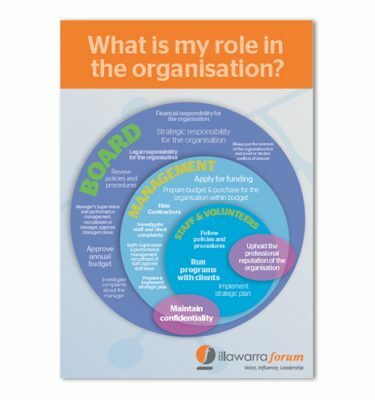 One of the most common questions we are asked at Illawarra Forum is where the role of staff versus board start and end. This graphic representation of organisational roles can be put up at staff and board meetings as a quick reference point during meetings to keep discussions and decisions at the correct level. This poster is available free to Illawarra Forum members (postage payable). Use your unique member code at checkout to receive the discount.